In the event that the Pharos Database Service fails to start (hangs and times out), confirm the settings within "Sql Server Configuration Manager". This scenario has been found to occur when customers are migrating their database, or bringing up a new SQL server- though it has yet to be determined exactly why these settings become misconfigured. 1) Open "SQL Server Configuration Manager" window, expand "SQL Server Network Configuration". 2) Click to highlight "Protocols for MYSQLSERVER". Confirm that TCP/IP's status is set to Enabled. 3) Right click "TCP/IP" and choose Properties -> IP Addresses tab. Ensure that the TCP Port field for each IP is configured for port 1433. 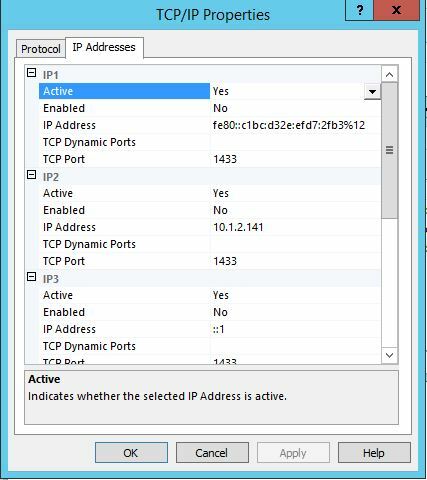 Ensure that the Active field for each IP is set to Yes, and the respective IP Address for each IP is configured properly. IP1 = IPv6, IP2 = IPv4, IP3 = IPv6 loopback, IP5 = IPv4 loopback. These IP address should be that of the server which hosts the sql server. 4) The Pharos Database Server service should now be able to start without issue. Jobs do not print with expected attributes. Single sided jobs print double sided. Double sided jobs print single sided. Black and white jobs print in color. Color jobs print in black and white. While Pharos Systems MobilePrint allows users to change the finishing options of jobs that have already been rendered by the print driver (plex mode, number of copies, color mode, and number of pages per sheet), some driver manufacturers have chosen to use proprietary (non-standard) attributes instead. By manipulating the printer driver configuration and managing the defaults for the user account running the MobilePrint Worker service, much of this can be resolved. 1. Log into the server using the account that runs the MobilePrint Worker service. 2. Go into Properties for the queue utilizing the Canon imageRUNNER-ADV 5045 PCL6 driver. 3. On the General tab, click the "Preferences" tab. Configure preferences here for SINGLE-SIDED finishing and COLOR mode. Click OK and APPLY this change. 4. Go to the Advanced tab. Uncheck the "Enable Advanced Printing Features" option. APPLY this change. 5. While on the Advanced tab, click the "Printing Defaults" button. Configure preferences here for SINGLE-SIDED finishing and COLOR mode. Click OK and APPLY this change. Once this has been done, launch the MobilePrint Administrator web page and ensure that the Canon devices is using the iR-ADV PCL driver and that the "Black and White Conversion" is being handled by the Printer. Windows service does not start. ERROR: "Error 1502. The service did not respond to the start or control request in a timely fashion" when starting a Windows service. The "Pharos iMFP Management Console" does not launch. ERROR: "The Pharos iMFP Management Console has stopped working." The "Pharos iMFP for Konica-Minolta" service requires that Microsoft .NET 2.0 components be installed on the host server. Click the "Add Roles" link. Put a checkbox in the "Application Server" option. In the dependency dialog box that appears, click the "Add required features" button to install .NET Framework 3.5.1 features. Select any additional Role Services that may be required for the server. Click "Next." Continue through any additional screens until you come to the "Install" step. Click the "Install" button. Restart the server as required. How can the SQL connection's server instance, username and / or password be updated for Pharos Systems SiteMonitor? This procedure utilizes the SiteMonitor installation utility (SiteMonitor.msi) to generate a new configuration file. It will be necessary to locate the correct Blueprint Enterprise installation package that matches the version that is installed. Move the PharosSystems.SiteMonitor.Service.exe.config file out of this folder and place it on the desktop temporarily. Launch the SiteMonitor.msi installer from the Blueprint installation package. Within the Site Monitor Setup window that appears, enter the correct SQL server instance, username and password for the SiteMonitor database. Click the Finish button when completed. Launch the Pharos Systems Site Monitor Administrator to verify that the service is online and operational. An invalid Windows Registry key is defined for the creation of the Pharos Systems Secure Release Service generic service for a Microsoft Windows clustered server implementation. This error will cause Secure Release Here job lists to fail at the terminal. Please use the attached update to the "Blueprint Installation Guide" that comes with the product software download. This update corrects a Windows Registry key error for the Pharos Systems Secure Release Service generic service configuration. Install appears to be successful, but after restarting the Pharos application does not run. Uninstalling and reinstalling does nothing to solve the problem. This only happens on some devices, not on most. There is a pre boot menu option called "Skip Disk Load". The option exists right next to "Cold Reset" which is one of the more frequently used options. We have seen folks turning this "Skip Disk Load" feature On by accident while trying to do Cold reset. If this is option is checked, then Device will not load anything from Disk. The solution loads fine on Disk, but Device behaves as if it doesn't exist. Since it is a sticky setting, multiple reboots and reloading of SW would not have any affect. Change "Skip Disk Load" to off and then restart the device. Note: Access to the boot menu should be done by individuals familiar with the HP hardware. Magtek card reader is connected to supported Xerox iMFP device, however card swipe events are no detected, i.e. nothing is happening after a card swipe. #1. Xerox devices MUST see sentinels in card data obtained from a Magtek card reader. If the data read from the card does not have sentinels, the Xerox device will completely ignore the card swipe. Your card readers were configured so that sentinels were disabled, therefore the Xerox was ignoring the card swipe. Note that the ; character the the starting sentinel for Track 2 data. The ? is the ending sentinel. #2. Some older Xerox devices do not like card swipes that contain only Track 2 data. This will create a situation in which the 1st card swipe will work but then subsequent card swipes will be ignored. To resolve this issue, reconfigure the card reader to send the Track 1 sentinel of % for the Track 2 data. This will trick the Xerox into believing that the data is Track 1, thusly allowing each card swipe to behave normally. Note that the % character is now the starting sentinel for Track 2 data. This will trick the Xerox into thinking the data is Track 1. The ? is the ending sentinel. How do I configure the MobilePrint listening port? Also, can I use a certificate with a common name (CN) that is different than the hostname of the MobilePrint server? 3. To change the default port number 9001 to 443, edit both configuration files and replace 9001 with 443. 4. To change the MobilePrint certificate, edit the configuration file named "LocalServer.config.xml"
5. MobilePrint uses the certificate configured as <SslThumbprint>MY CERTIFICATE THUMBPRINT</SslThumbprint> where MY CERTIFICATE THUMBPRINT is the hexadecimal thumbprint of a certificate in the Windows Certificate Manager (certmgr.mmc) on the MobilePrint server. 6. In addition, the certificate's common name (CN) should match the hostname configured as <Name>MY MOBILEPRINT SERVER HOSTNAME</Name> in both "LocalServer.config.xml" and "MobilePrint.Configurator.config.xml"
See Example 1 and 2 above. The issuer or central authority (CA) who issued (signed) the CN certificate must be stored in the Windows Certificate Manager (certmgr.mmc) as a trusted or root certification authority. iMFP for Xerox fails to successfully manage a Xerox device. The management console shows success (device status is Managed) but the blocking screen on the Xerox device does not show the expected screen with the key. It may show a soft keyboard and request authentication. Attempting authentication may result in a DNS error message. With the McAfee feature enabled on some Xerox devices some of the configuration performed by the iMFP for Xerox management console appears to be blocked. As a result the installation and configuration is incomplete resulting in the symptom above. Disable the McAfee protection on the Xerox device. This is performed from the web interface of the device, Properties tab in the Security section. This will require a reboot of the device. After the device reboots use the Management Console remove the Pharos and then reinstall the Pharos solution. At this point the installation should succeed and the expected blocking screen will be displayed. NOTE: Pharos is working with Xerox to understand this further. A software update may be made available in the future to address this. On some devices with McAfee enabled our installation process works fine. We do not yet understand fully what is causing this. We have observed that McAfee can be successfully re-enabled after Pharos installation and the engine runs successfully. Create customized Pharos Popup for Mac package. As in previous versions of the Mac package, our most current offering allows for customization of the package for mass deployment. This will allow users to install shared Pharos Uniprint Print Server queues at the same time that the Popup and Notify client are installed. Please download the "TechNote Automatic Popup and Print Queue Configuration for Mac OS X" attached for those instructions. The Pharos Uniprint 8.3/8.4 MacOS X base package must be downloaded separately. Understand the current supported product list for Microsoft Windows Server 2012 R1 and R2. Configure Pharos MobilePrint to use Office 365 as its email server. To configure Pharos MobilePrint for Microsoft Office 365 Mail Server, perform the following steps. b. In Outlook Web App, on the toolbar, click Settings (the Gear icon) > Options > Account > My account > Settings for POP and IMAP access. c. The POP3, IMAP4, and SMTP server name and other settings you may need to enter are listed on the Settings for POP and IMAP Access page under POP setting or IMAP setting, and SMTP setting. a. Launch the MobilePrint Administrator web page (https://<MobilePrint Server's hostname>:9001/admin/settings.html) and log in. b. Go to the Email Server Connection menu item. c. Modify the IMAP and SMTP Account sections to reflect those found in the Office 365 configuration (step 1). An example is shown below. Please note that the Port, Username, and Password fields will be different. d. Save the configuration and test. ERROR: "Service cannot be started. System.TypeInitializationException: The type initializer for '<Module>' threw an exception. ---> System.AccessViolationException: Attempted to read or write protected memory. This is often an indication that other memory is corrupt." It has been found that the installation of Microsoft .NET 4.5 on a server running any build of Uniprint 8.3 (including Service Pack 1) will cause the Secure Release Service (SRS) to stop working due to an incompatibility between a component of SRS and a module installed with .NET 4.5. This can happen during Windows Update with the application of Microsoft patch KB2858725. Action: Do NOT install Microsoft .NET 4.5. You will be notified via the Pharos Communities site when it will be safe to install this version of .NET (this will be accompanied by an update to Uniprint). Action: Uninstall Microsoft .NET 4.5 and then reinstall Microsoft .NET 4.0. This will restore .NET 4.0 functionality. You will be notified via the Pharos Communities site when it will be safe to install this version of .NET (this will be accompanied by an update to Uniprint).